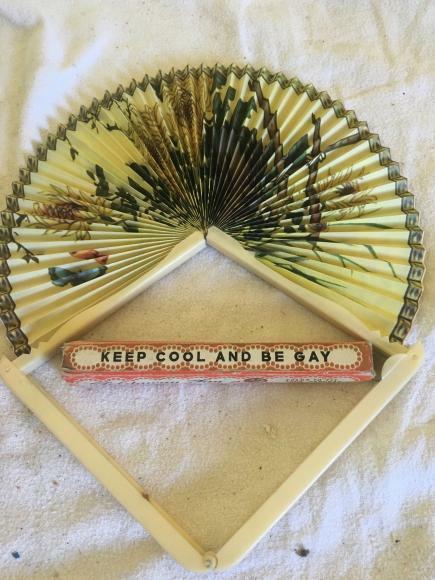 In excellent condition , this is a ladies foldaway fan which fits into a handbag. 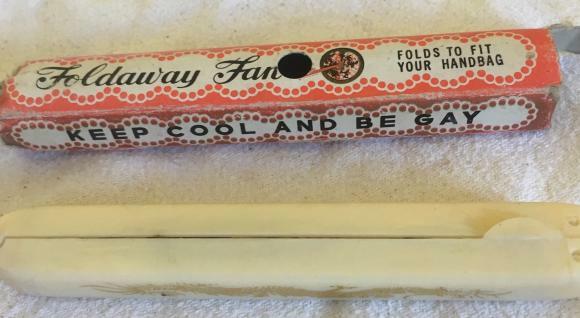 It is undamaged and comes in its box which has the great slogan of Keep cool and be gay. In an almost unused condition, this is a wooden construction mischief Marble maze. Complete with all the parts and the marble. In excellent condition although the box is a bit scuffed. the coronation of Queen Elizabeth II . The box is a bit worn. A lovely vintage 400 piece jigsaw from the Terminus series. This one depicts a South East Airlines plane. Another 400 piece cardboard jigsaw from the Good Companion series. This one is called Landing the Catch. A lovely c 1950s wooden 150piece jigsaw by Salmon Academy. This one depicts Georgian couples walking in a garden. box is a bit worn at one end. A scarce board game from the Geographia series which dates from the early 1930s. This one is called Motor Chase Around London. It is complete with the 4 diecast cars and comes with the instructions. The board is very clean. Great graphics on the box lid. A used but still in very good condition vintage 6" diameter metal fan tin by Tala. A c1950s 400 piece cardboard jigsaw by Tower Press called Sharing the Spoils and depicting pirates.